Creation of Content Templates is best explained in this video: Training Video about Creating Content Templates. 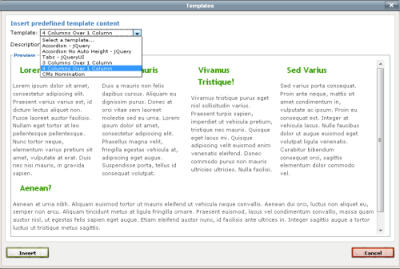 Content Templates can be created to allow easier content creation for your site content authors. mojoPortal content management system comes with a few templates and you can add custom templates (as of mojoPortal CMS version 2.3.0.8) by using the Administration Menu > Content Templates tool. You can even control which roles the templates are available to. Content Templates were first available in 2.3.0.4 using FCKeditor. As of 2.3.1.5, you can use them with TinyMCE and as of 2.3.3.2, you can use them with CKeditor. In mojoPortal 2.3.0.4 we introduced some content templates to make it easy to use widgets like the jQuery Accordion or jQuery tabs. These content templates show up in the FCKeditor toolbar using the button to the left of the "Style" drop-down. The alligator grew from 5'6" to 6'7" in one year. The alligator grew from 5 feet 6 inches to 6 feet 7 inches in one year. The alligator grew from 5&prime;6&Prime; to 6&prime;7&Prime; in one year. 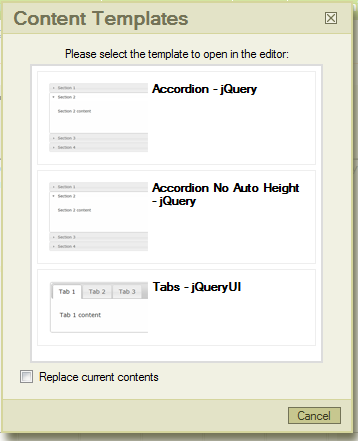 Starting with mojoPortal 2.3.1.6, content templates are available in TinyMCE. They are accessible by clicking the button to the left of the "Format" drop-down. Clicking the button reveals a window with a list of content templates. Selecting a template from the list will show a preview of the template.